That You Can Install Yourself? 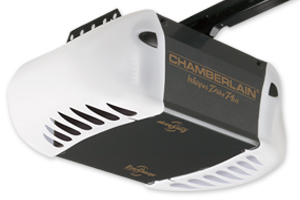 Chamberlain garage door openers come in 1/2 and 3/4 horsepower units that are available in belt drive, screw drive and chain drive power-heads. They have a full offering of lighting solutions at the power-head end, up to two 100 watt bulbs for security. One of their models features a DC motor with a 3/4 horsepower comparable rating and a power pack that will operate the garage door for up to 24 hours in a power outage. The company specializes in the design, manufacture, assembly, and distribution of residential and commercial door and gate operators, accessories, and access controls. They have 40 years of experience in those areas and are committed to quality consumer products. They have achieved the ISO 9001:2008 certification and their products receive the Good Housekeeping seal. The Premium Whisper Drive® Plus with EverCharge® Standy Power System shown at the left is the Chamberlain garage door openers top model. It features a DC motor with 3/4 horsepower comparable rating and a belt drive that is super quiet. The belt is constructed like a steel belted tire, reinforced with flexible steel cords for a long trouble free life. This model comes standard with the EverCharge® standby system that will operate the garage door opener for 20 cycles over a 24 hour period during a power outage. When the power comes back on, the system automatically recharges. All safety and security features also operate from the EverCharge® standby system ensuring your family is protected. The power-head also features smooth start and smooth stop to reduce the noise levels if you have living space above or nearby the unit. Other features include the auto force-sensing technology that constantly monitors temperature and changes the garage door-force to adjust for floor height and door track movement. There is 200 watts of lighting at the power-head with adjustable light time delay and the unit is HomeLink® compatible. The Protector System® sensors project an invisible light beam across the plane of the garage door opening and automatically reverses the door if anything interrupts the beam while the door is traveling downward. The sensing technology will stop the door from closing if contact is made with a person or object. Security+® anti-burglary technology assures a new code is sent every time the remote control is used. PosiLock® theft protection assures that once the garage door is closed, it stays locked unless you send a new valid remote signal or use the manual release handle. The Model WD926KD has attained the Good Housekeeping seal for garage door openers and the Handyman Club of America's Seal of Approval. This model has a full line of accessories available. The PD432D Premium Power Drive® Screw-Drive System shown at the left features a 1/2 HP motor that is smooth-running even in the most extreme temperatures. It's enclosed drive screw makes it completely maintenance-free which is a big PLUS for the busy homeowner. There is no metal-to-metal contact for the smoothest and quietest operation if the unit is near living spaces. The rail is self-lubricating. The unit features a rugged all steel chassis and is generally easy to self-install. The power-head features two 100 watt light bulbs with adjustable light time delay. The electronics are HomeLink® compatible. All of the safety and security features found on the model above are also standard on the PD432D model. This unit has earned the Good Housekeeping seal for garage door openers and has numerous accessories that are available. 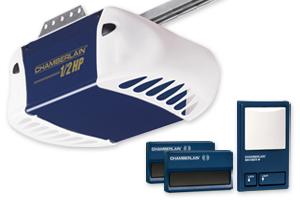 Chamberlain garage door openers are geared toward the home-handyman who wants to install the unit themselves. They can be purchased from most home improvement and hardware stores. The company has a good record of standing behind it's consumer products so Chamberlain® is a good choice for the money.